Done deal for me, though I will probably go for a C65 GMT. Of course YMMV! You are right, i do like the slimmer and more simplified bezel..hmmm, I also agree on the blue dial, was just showing the black dial for comparison sake. I think if i get the c65 auto, that will loosen up so cash for the new c60 coming in May. Thanks for the help! I prefer the lighter coloured markers and hands of the Oris and the gold highlights of the minute markers but prefer the shape of the hands and quarter markers of the C65. The bezel of the C65 is better IMO as it's cleaner looking and has all the 5 minute numerals whereas the Oris only shows 10minute intervals in numerals. I think the C65 deals with the date better than the Oris as it doesn't affect the quarter marker at 3 whereas on the Oris the marker at 6 looks like it's underlining the date as it's much reduced in size. What is the length of the warranty of the Oris? Does the CW name logo at 9o'clock bother you ? If not then buy the C65. It's an excellent overall design, looks good on the wrist, wears smaller than it's size IMO and looks great on bracelet or leather (I'd order it on the bracelet and buy a Hirsch (or similar) Performance strap) although the CW leather straps suit the look of the C65. I am sure I will be in the minority here, but I actually prefer the Oris. I think the minute markers on the bezel look good, I like the lume dot on the second hand, the date looks good at 6 o clock & it has the logo where it should be. I am sure whichever one you choose you will be very happy., good luck. I tried the bronze edged bezel Oris in an AD last week. Loved the subtle hit of bronze (and would like to see how it’s patina develops over time) and the 40mm size was pretty decent on my wrist. A couple of thinks put me off though. Firstly was the bronze. The one I tried had clearly been on and off a number of wrists since the leather strap was very well scuffed and worn (no way would I have accepted the watch in that state if I was to part with any cash!) and yet the bronze was neither raw or showing any obvious signs of patina either. When I asked about this I got a pretty non-descript answer and am wondering what alloy mix is used and if/how this will patina. Second was the price for a spec that is no higher than the CW - same movement, same materials, very similar look and I could not justify spending double the price for no significant spec upgrade. Oris are releasing a version that has an all-bronze bezel rather than just an edging and a blue dial. I’d like to see that. They are both nice watches. But it’s the C65 for me, blue dial. Nicer hands. Blue hue on glass. I will vote for the CW as well. With a minute track on the dial, no need for another on the bezel. Gives the C65 a cleaner, less cluttered look. They are both fine looking, in my book..maybe find room for both?..don't mean to cecil the thread, but you should take a look at the Oris 65 bonze bezel, as well..pretty much the same as the Movember version, but check it out..here is an old pic of mine before I switched straps..btw, Ebay has had a previously worn example available recently at a pretty nice price!!.. It’s got a beautiful ink-blue dial, gold tinted hands and markers and non-vintage lume. WRT the bronze, I’ve read that they’re using ‘an alloy that develops less patina’. Whilst they’ve not stated what it is my guess would be an aluminium bronze rather than phosphor bronze. Thank you for all the advice and opinions! Very helpful! As Thunder1 suggested, the Oris with the bronze bezel is beautiful and I also wasn't sure how the patina would evolve. Thanks for the pic! Beautiful watch! 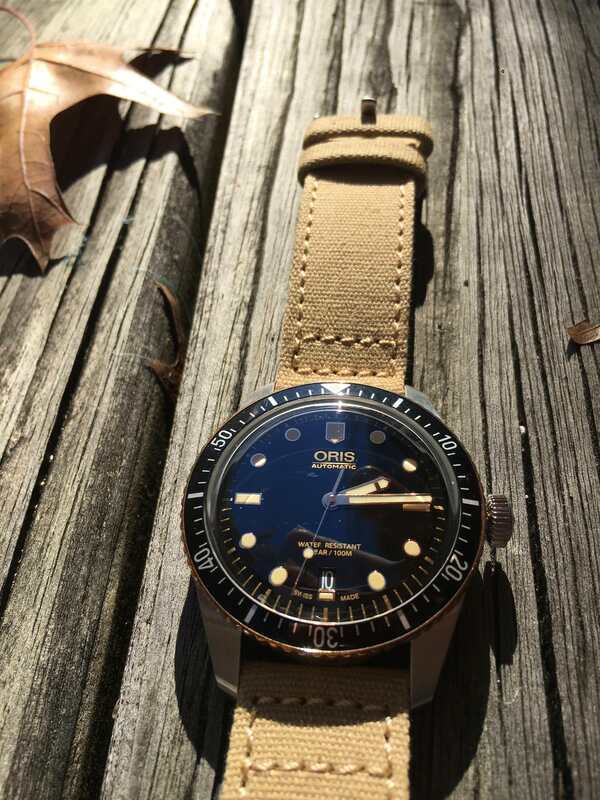 Maybe the C65 in blue and the Oris with the bronze Plenty of options here and will get more complex when the new C60 comes out in May! Beaverbrooks had a movember vision for only £1035 in their sale, I think it has gone now. At that price point I think it wins against a cheaper CW.